Daryl Aguirre became the first to win a six-figure tournament prize in a legal Texas tournament. 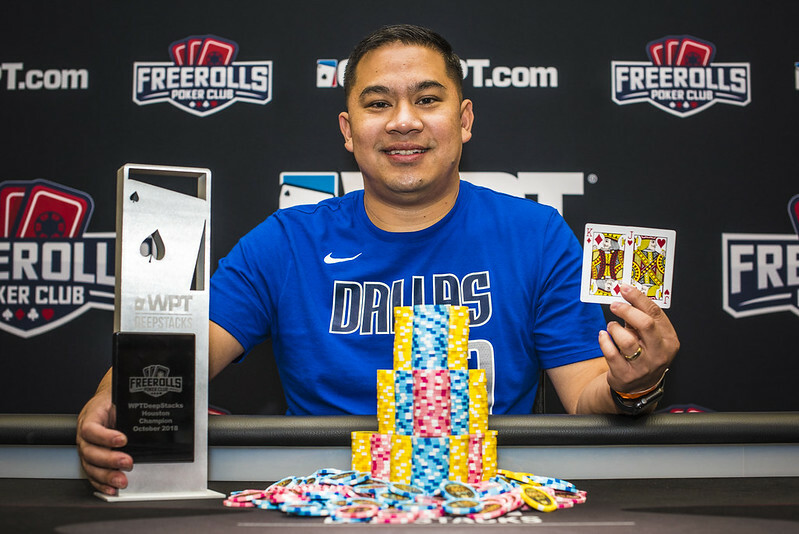 The debut of a major poker brand in Texas was the subject of much interest in the poker world, and WPTDeepStacks Houston $1,000 Main Event wrapped up on Monday. At the close of the six-day event — featuring four starting days — Texas recreational player Daryl Aguirre emerged atop a field of 790 entries to win a first-place prize of $143,765, dwarfing his previous poker earnings of about $16,000. "This is just so surreal, it's just crazy," he said. "Three days, from Saturday all the way to here to actually win the tournament with this big buy-in and 790 entries, it's just crazy." The 790 entries created a prize pool of nearly $800,000, setting a high bar for future mid-major events that may come through the poker-crazy state of Texas. Some of those who got a piece of that pool included Josh Turner, DJ Alexander, Ray Henson, Max Young and Kunal Patel. According to the live updates, Aguirre was down to crumbs with under 20 players remaining after he doubled up with ace-king over ace-queen but then lost with ace-deuce against queens when a player with just seven big blinds shoved on the button and Aguirre called from the big blind. Left under 10 big blinds, he was able to run it up from there though, going into the final table and the final day with 4,495,000 at 50,000/100,000/100,000, good for just below the 4,920,000 of chip leader Robert Bresner. The rest of the field was all under 32 big blinds, setting up a short-stacked finale overall. It was all short stacks early as the player with less chips won the first five all-in pots to further build the pressure on everyone trying to avoid being the first out. Finally, Jules Allum got 10 big blinds in with ace-jack and couldn't overcome the ace-queen of Dennis Brand. Lam Tran then got in a massive combo draw but bricked out against Jason Brice's top-top. Jose Cavazos followed, having gotten unlucky for most of his chips with queens against the jacks of Brice in the final table's first hand. Brice also busted Satheesh Francis with over for Francis' last eight big blinds. He followed up with two more eliminations, ace-queen over the queen-jack of a short-stacked Brand, then ace-jack over the queen-six of Mohammad Arani, who jammed under the gun with crumbs. That left Brice as the overwhelming leader with 19 million out of 23 million or so at 100,000/250,000/250,000. Start-of-day leader Bresner got his stack of about 1.9 million in against Aguirre, who held with against after an flop to get up to 8 million and give himself a fighting chance against Brice heads up. Aguirre would take a slight lead shoving postflop in a reraised pot, and then he sealed the deal against Brice on a board of . Having continuation-bet the flop after raising preflop from the big blind, Aguirre check-jammed holding . Brice called with and needed help with his second pair, failing to find it when the river ended the tournament in Aguirre's favor.